Do your kids get up at the crack of dawn on special holidays and *try* to tip toe through the kitchen and *secretly* make you a 5 star breakfast that they then lovingly hand deliver to your bed side (dribbles of milk going over the side every other step or so)? And then the older sons got even older, and under years of my diligent, often forced tutelage, they got really good at improving upon the classics. Like pancakes for example. 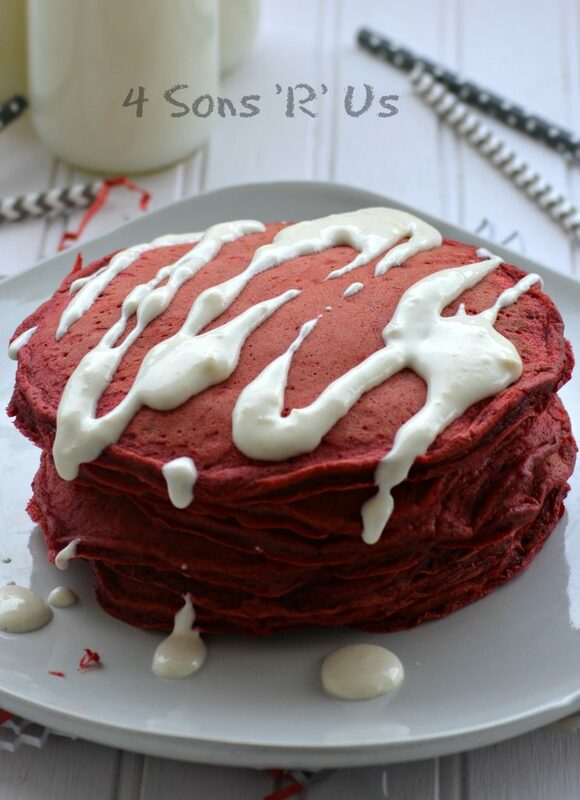 Red Velvet Pancakes. With Glaze Frosting. Because why wouldn’t I want that hand delivered to me for breakfast any day of the year? Crumbs on the coverlet be damned! I so love red velvet anything. And it doesn’t get anymore decadent than this for breakfast, well except for that one time one of the sons made Boston Cream Pie Pancakes, but that’s for another post. Anywho, Red Velvet Pancakes with Cream Cheese Glaze. Yes, Sirree … that’s the special breakfast for me. And it’s perfect for Valentine’s, or even Christmas, or really any day you want to say an edible ‘you mean the world to me’. And while I love all things red velvet, I can tell you a good red velvet is about more than just a few added drops of red food coloring to an old recipe. It’s all about the taste. And that’s one of the main reasons I adore this recipe in particular, it embraces all the very best things about red velvet cake: its vibrant red color that just jumps off your plate, that subtle hint of fine chocolate, and luscious cream cheese frosting in every bite. It’s ‘I LOVE YOU’ by the forkful. 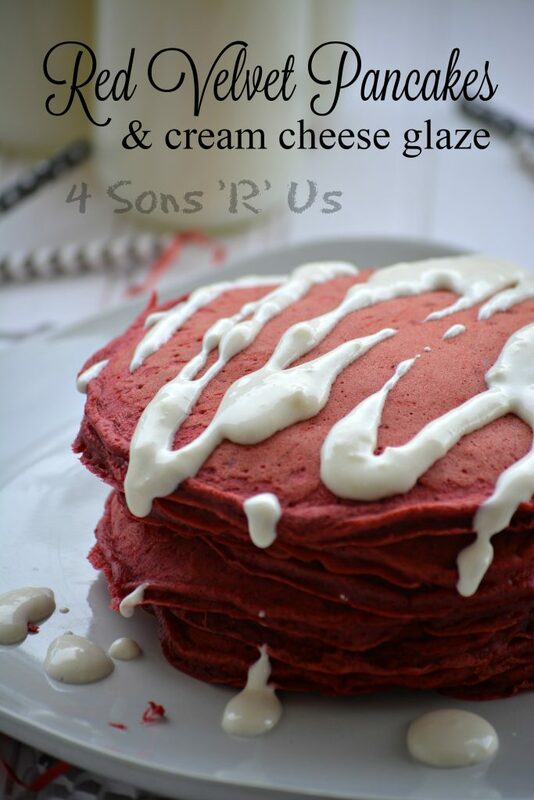 An easy recipe for a stack of fluffy, cake-like red velvet pancakes with a that signature hint of chocolate piled high and dripping with a generous drizzle of cream cheese glaze. In a mixing bowl, whisk together the flour, cocoa powder, baking powder, baking soda and salt until evenly dispersed and set aside. Measure out the milk into a liquid measuring cup and stir the vinegar into the milk, allow the mixture to rest for about 2 minutes. Ta-da, you made buttermilk. Now, pour the buttermilk into a separate large mixing bowl and add in the sugar, eggs, food coloring, vanilla, and melted butter. Use a wooden spoon to stir the mixture until all the ingredients are equally incorporated and the mixture's smooth. Stir the dry ingredients into the wet, slowly to avoid a mess, mixing until the batter's just combined. On the stove top, heat a griddle pan or large skillet over medium low- medium heat. Butter, or spray with non stick cooking spray, the griddle if necessary and pour about a 1/4 - 1/3 cup of the batter at a time onto the hot griddle. The batter will look liquidy at first, but that's ok, it will puff up and cook just fine. Cook until bubbles begin to appear on the top surface of the pancakes, then use a firm spatula to flip the pancake over, and cook until its cooked through. Serve the cakes warm with Cream Cheese Glaze drizzled, or poured, overtop. In the bowl of a stand mixer, use the whisk attachment to whip together the cream cheese and butter until they're creamed together smoothly and fluffy. Add in the remaining ingredients and whip them together, about 1 minute or until the mixture's evenly incorporated and smooth. At this point, if you think the glaze is too thick, you can add extra milk to thin. I'd add 1 tsp at a time. Store the prepared glaze in an airtight container in refrigerator until you're ready to use. I totally agree that the key to a good red velvet is not only the color, but the taste. Looks delicious! I do also like your cheese glaze, will make it next time for sure! Thanks a lot for sharing! Great minds sure do think alike, right? The glaze is what takes them over the top. I do like your healthier twist using actual beets in your recipe. Thanks for sharing! Pingback: Love is in the Air! 15 Valentine’s Day Ideas to Make Your Day Sweeter! Pingback: Best Homemade Pancake Recipes - Refresh Your Breakfast!